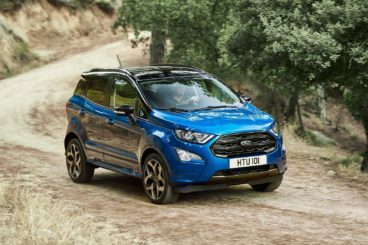 The new Ford EcoSport Diesel Hatchback looks like an SUV but it’s not quite big enough to cope with larger families on the road. 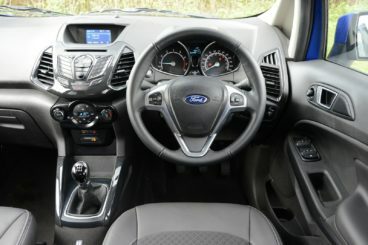 More of a compact MPV, it’s based on the Ford Fiesta, looks good and can boast an attractive cabin. It’s not what you’d call fast, but its engines are lively and eager, and there’s lots of space inside. However, there are lots of caveats for buyers to weigh up, too. OSV takes a closer look at what it’s all about with our 2018 Ford EcoSport Diesel Hatchback review. It’ a Ford alright – but it doesn’t drive like a Ford. At all. Indeed, the most disappointing aspect of the new EcoBoost is that it’s bland to drive. Accurate steering is fine at first, but it soon becomes apparent that it’s just too light. There’s a real lack of feel too, although a decent amount of grip means you can still take corners at speed without your confidence being undermined too much. So while it’s based on the Fiesta, it doesn’t drive like its smaller sibling. It’s taller too and leans noticeably in bends. Meanwhile, its suspension setup is on the firm side and you’ll feel it when you hit lumps and bumps in the road. Insulation is poor too, with the tyres making a fair amount of noise. In terms of its engine, there’s not a lot to choose from on the diesel front. In fact, there’s only one – a 1.5-litre unit that develops 99bhp. It can’t be specified with an automatic gearbox and comes with front-wheel-drive only. This means it saves you money at the pumps, but a 0-62 time of 14.0 seconds flat is going to make it far too sluggish for some buyers. That said, it’s got lots of pulling power in reserve, which can make it more appealing than any of the petrols. It feels lively as you pull away but it does soon tail off. This is the review of the EcoSport diesel, but for the sake of comparison, there’s also just the one petrol engine available. It’s a 1.0-litre EcoBoost unit that’s available in two separate guises. The smaller of the two develops 123bhp, while the biggest one produces 138bhp. The former can complete the 0-62 dash in 12.6 seconds, with the former taking 11.8 seconds to complete the same sprint. Going back a few years, Ford used to adorn their EcoSport with poor quality materials. Thankfully, the materials used in 2018 are better, although they’re still not on par with what the best cars in this sector can offer. Insulation is a bit of a pain at high speeds, while the ride doesn’t really settle down on the motorway. If you want a car that offers a relaxing driving experience, this isn’t the one to go for. Its dashboard is a lot like the Fiestas. Everything is logically arranged and user-friendly, while a brand new SYNC3 touchscreen infotainment system dominates the dashboard. The entry-level trim has to settle for a modest 6.5” screen while the higher spec trims get an 8” screen with sat-nav. Is the Ford EcoSport Diesel Hatchback practical? This is really where cars like this excel – but the EcoSport is average at best. Its weakest area is its boot. It measures 335-litres, which is on the small side for this market, and it comes without underfloor storage. Worse than that, you can only access it via a side-opening rear door, which makes things very awkward – especially when a car is parked close by. Mercifully, Ford has at least seen enough sense to remove the large spare wheel. Other than that, the doors don’t open wide enough to make access to the rear seats easy, although the seats recline and can be pushed forward to make more boot space. Headroom is good thanks to the car’s tall body shape, but the fact that it’s so narrow means three adults will feel cramped back there. The Zetec is now the entry-level model and it comes with 16” alloys, SYNC3, air conditioning and LED signature lighting. The Titanium model adds a bigger 8” touchscreen, bigger alloys. keyless entry, rain sensing wipers, climate control, cruise control, partial leather seats, silver roof rails and a reversing camera. The ST-Line is the sporty model. It gets darker alloys, a body kit, a unique front grille design, handbrake grip, sports pedals and a leather-trimmed steering wheel. In terms of how safe the car is, it’s disappointing that the EcoSport was only awarded 4/5 by Euro NCAP for its crash test performance. It scored 93% for adult occupant protection but just 55% for safety assistance. Optional safety equipment includes blind spot monitoring, but autonomous emergency braking isn’t available either as standard or as an optional extra. Prices for the new car start out from £17,495 and rise to £21,595. For more information on our leasing deals, you can check out our page here. In terms of its running costs, a 1.5-litre diesel engine that produces 99bhp is the cheapest to run. It can return 68.8mpg and emits just 108g/km of CO2. This gives it a BiK rating of 26%. The petrol engine, on the other hand, returns 52.3mpg if you pick the 113bhp variant and 54.3mpg if you pick the 138bhp variant. Despite being more expensive to run, and despite not being as clean as the diesel, the petrol variant has a lower BiK rating of 24%. The diesel, meanwhile, sits in insurance group 11. Prices are good if you go for the diesel model and don’t specify a four-wheel drive petrol. The dash is super user-friendly and looks a lot like the one in the Ford Fiesta. There’s plenty of room available, with the car’s tall shape ensuring headroom is especially good. There are real limitations on this front, including an awkward boot door and – if you stick to the entry level model – it’s hard to park. Let’s see how the car fares against its rivals in the comparison section of our 2018 Ford EcoSport Diesel Hatchback review. The new Nissan Juke looks just as fresh as it did when it was first launched. However, there are now signs that it’s not ageing too well, such as poor cabin quality. 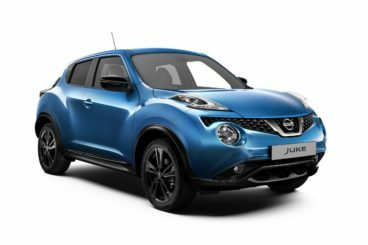 Out on the road, the Juke isn’t anywhere near as fun to drive as its quirky looks might have you believe. Worse still, insulation isn’t great and if you hit a large pothole, you’ll certainly know about it. That said, it’s not an awful car to drive. It handles respectably and body lean is well managed. The biggest issue is that its steering is just too light and there isn’t as much grip as we’d like. In terms of its diesel engines, there’s only one available. This is a turbocharged 1.5-litre dCi unit that can get you from a standstill to 62mph in 11.2 seconds, which is pretty nippy. However, it’s a noisy engine that can only be drowned out if you turn the radio right up. Running costs? The diesel lacks the character of the petrols and is hard to recommend unless fuel consumption is a priority of yours. If it is, returns of 70.6mpg will be hugely attractive. Inside, the Juke can boast a funky design, but it ultimately lacks quality. A centre console is available in numerous different colours, a raised driving position is good for visibility, but insulation and ride quality are poor. There are other problems: The entry-level model is saddled with an old CD player and radio, and the dashboard is made from scratchy, hard, thin plastic. It doesn’t seem very robust. Is the Nissan Juke practical? Nissan had to make its 251-litre boot bigger to stand any chance of winning customers over, and it’s now grown to 354-litres. However, this increase only applies to front-wheel-drive models. Other than that, legroom is decent at best but a low roofline makes rear seated passengers feel hemmed in. Storage solutions are sparse and the door bins are too small. The glovebox, meanwhile, is adequate at best. The new Renault Captur is stylish, comfortable and has so far proven to be a big hit with buyers. It’s not going to excite you, but the Captur is confident and competent on the road. Its light steering might prove to be a bit of a problem on the open road, but in the towns and cities it makes perfect sense. That said, it does lack feel and this will present a few problems on weaving country roads. Body lean is also a bit of an issue. Overall, though, it’s a comfortable car that – for the most part at least – is easy to drive. In terms of its diesel engines, there’s just one available. It’s a 1.5-litre dCi unit that produces 89bhp, and which is a capable performer on the motorway. Indeed, it suits the Captur well if it’s a pure workhorse of an engine that you need for longer trips. It’s a tad noisy but it will make a lot of sense to a certain buyer. Running costs? 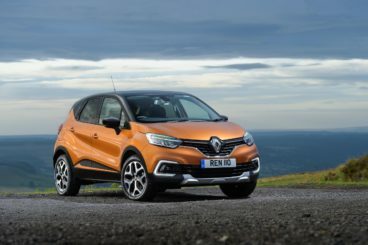 That’s the thing – the diesel is small and it combines well with the low weight of the Captur. However, Renault is yet to release official fuel consumption figures, so we’re still waiting on that one. What we do know is that it emits 138g/km of CO2 and has a BiK rating of 32%. It also comes with an Eco button, which saves you fuel by reducing engine power. Inside, the Captur is remarkably comfortable but it’s let down by the quality of its plastics. Renault has added more soft-touch plastics this time around but it still can’t compete with more upmarket rivals. A height adjustable driver’s seat is useful, you can personalise your Captur with different colours and subtle tweaks, while a two-tone covering for the dash looks great. Is the Renault Captur practical? It’s based on the Clio but can offer more space inside than its smaller sibling, and this includes more rear legroom. It’s still a fairly compact car, however, and this comes in handy when it’s time to park. There are plenty of storage spaces here and there, but an 11-litre glovebox that you’ll find on European models is missing. The boot, meanwhile, measures 377-litres and can be extended to 455 when you push the rear seats forward. The EcoSport doesn’t cover itself in glory at times and trails rivals on the practicality front. It’s also not as fun to drive as a Ford product usually is, and while cabin quality is better than last time, it’s still not great. Hardly a firm favourite, then. On the other hand, the Ford EcoSport Diesel Hatchback is affordable, roomy, comes with more tech than last time and looks pretty good. The problem is, it’s far from the best in this class.